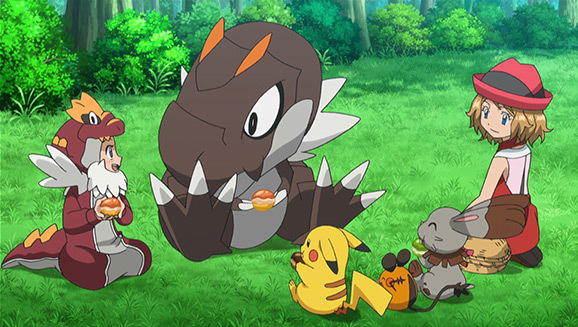 The latest episode of Pokémon XY fills fans with emotion, as well as featuring the show debut of a new Pokémon. The episode is the first Bonnie-centric episode since “So You’re Having a Bad Day” (around 15 episodes ago) and while there are rarely any major events in the episodes focusing on Bonnie, I’ve liked how the writers find brand new ways to make the character entertaining- which is especially difficult when Bonnie is too young to be a trainer and limits what the writers can do with her. In my opinion, this is one of (if not the) best Bonnie focused episode of the show. It’s not one of the best episodes of the XY series itself, but I do feel it’s the best Bonnie episode. The plot of the episode focuses on Bonnie taking care of a Tyrunt that Team Rocket stole. Team Rocket had captured it with the intention to evolve it to a Tyrantrum, but it escaped and ended up coming across Bonnie, Clemont, Ash and Serena. While the plot in itself is pretty straightforward (in my opinion), there are numerous twists in the episode that make it really heartfelt and (at times) difficult to watch because of how sad it is. Team Rocket returns to try and catch Tyrunt again, with Bonnie (not for the first time) showing that even though she isn’t a trainer she can still battle when necessary. When Team Rocket succeeds in catching Tyrunt, Bonnie (in a way similar to Ash) recklessly attempts to get Tyrunt back. Bonnie’s willingness causes Tyrunt to evolve into Tyrantrum (making its debut in the anime) and Team Rocket are sent blasting off again. If Tyrunt evolving into Tyrantrum wasn’t a big enough twist, there was another twist to come in the episode. 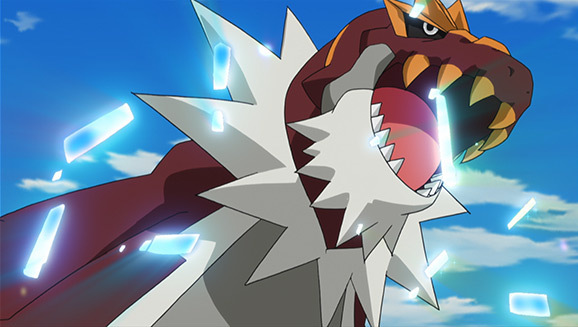 Bonnie decided she wanted to take care of Tyrantrum permanently, but Clemont’s Pokéball bounced back off it indicating that it already has a trainer. Two members from the Pokémon Fossil Research Lab show up and it’s revealed that Tyrantrum belongs to them. 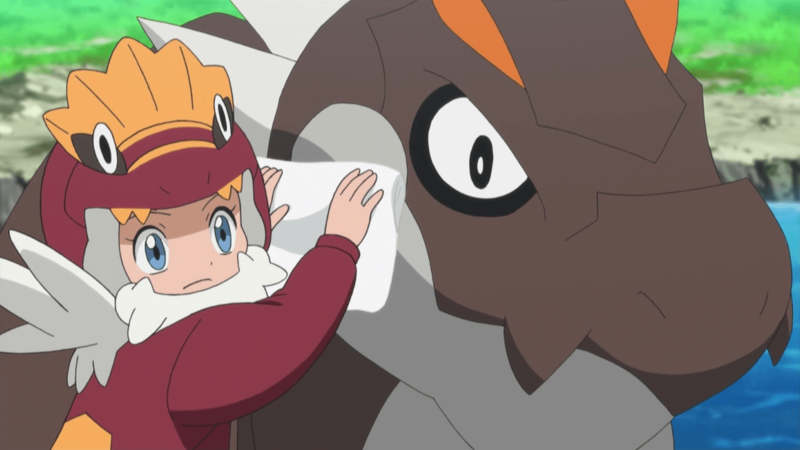 The episode concludes with an emotional scene, as Bonnie says goodbye to Tyrantrum after a tour of the lab and promises to visit it again someday. In my opinion, while I don’t consider it among the best episodes of Pokémon XY, it’s definitely one of the most heartfelt episodes and leaves an impact on viewers. The development of Bonnie and Tyrunt (later Tyrantrum)’s relationship was handled really well and hopefully we’ll see Tyrantrum make a return in another episode.